This particular picture is pretty awesome. 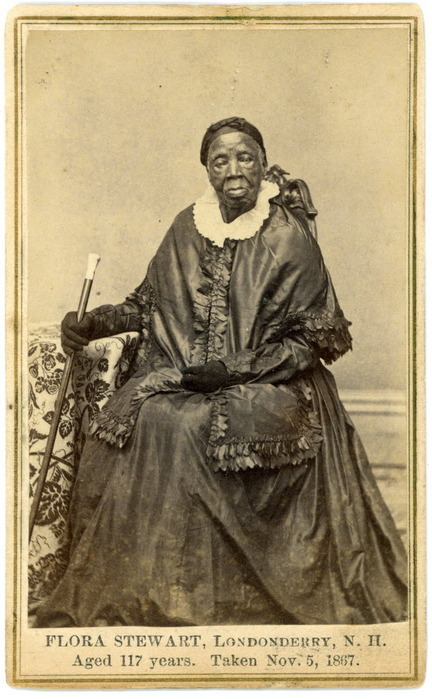 The woman in the photo is Flora Stewart, and lore is she was a house slave in New England during the American Revolution. She died in 1868. There’s some more information on her at Nutfield Geneaology. It seems that her age is often disputed, and town records have been the subject of questioning in regards to her date of birth. Regardless of if her age at death was 120 years old or whatever, it’s still amazing to think that this woman possibly saw two world changing wars. She saw herself freed and surely witnessed the beginnings of the abolition of slavery. She also lived a huge range of fashions and styles. It’s mind boggling to think someone can live so long. Anywho, I thought this was a really cool picture and thought I’d share. Have a great weekend! This is a beautiful ad from Vogue, 1955. It’s currently for sale on RubyLane for $15. I LOVE LOVE LOVE this bathing suit. I’m a sucker for sage green and I love the bloomers… though I’m not sure how well they would work in real life. I’d probably look like I was wearing a diaper, but I might just test that theory and let y’all know. This is a lovely picture of Queen Alexandra in 1884. She’s wearing an absolutely stunning seaside dress and looks somewhat forlorn. I can’t imagine how she could be in such a wonderful outfit. I especially love the subtle detail of the cuffs. Happy Black Friday everyone! I will not be partaking in the festivities, but if you are and you need a little break from all he fun, this post is for you. Today we are going to take a look at one of my favorite composers of all time. I give you, Johannes Brahms. 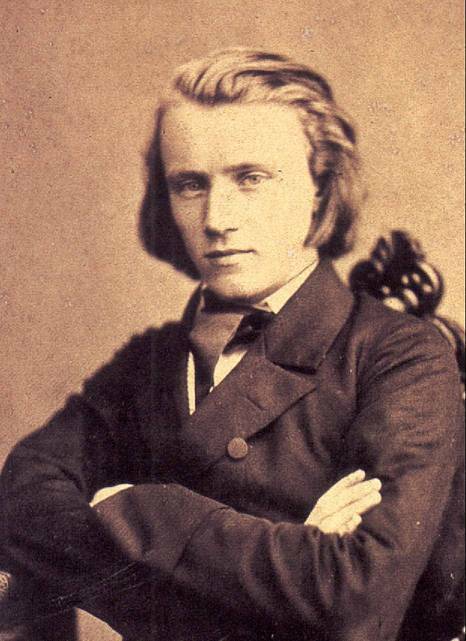 Johannes Brahms, ca 1853, 20 years old. I’ve played a couple of pieces that he composed. One of them being Rhapsody in G minor, op79 no2, which I played 5 years ago for my audition into music school. Since I’m doing The 1888 Project I’ve been looking at gobs and gobs of CDVs and this one is one of my favorites I’ve come across. This series of photos, done in a gif, is from the Metropolitan’s collection. What I love about this gif is that you can see the movement of the dress and you get a full turnaround to see what the other side of the dress looks like. The couple also seems to be having a good time, which you don’t see often in antique photographs.